This Japanese horse mackerel from the Uwakai Sea in Ehime Prefecture is quick to prepare (comes pre-coated with starch). This fresh Japanese horse mackerel has been washed and then covered with potato starch for use in making karaage. Karaage is a Japanese style of deep-frying. The bones in the heads of these Japanese horse mackerel are tender, so once the fish has been fried into karaage everything below the head can be eaten. Preparing fried foods such as karaage and tempura can be quite messy and time-consuming, and as a result many people avoid making their own at home. However, because this mackerel arrives ready to fry, it can save you a great deal of time and nearly all of the cleanup! 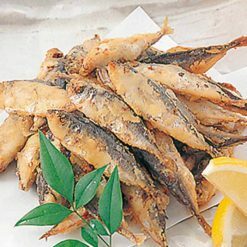 To fry: Without defrosting them, fry the fish in oil at about 170℃ for about 3 minutes.Note: Do not fry a lot of fish at the same time. If there is frost on the fish it can cause the hot oil to jump, so please be sure to remove any outer frost before frying. 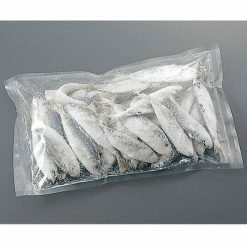 This product contains japanese horse mackerel (Uwakai Sea, Ehime Prefecture), potato starch, table salt..